First of all, thanks to everyone that entered the giveaway. It was really enjoyable to read your favorite 2012 moments in racing, and, not surprisingly, it seems like Paynter's recovery was among the most popular. In a random drawing, Alicia McQuilkin was the winner of the contest. Congratulations! You should feel special as this is the very last calendar left in the Blood-Horse building. We are completely sold out! 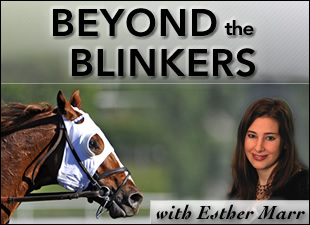 Today I bring you the story of a very special OTTB named Metro Meteor. When I received an email a couple weeks ago about this former racehorse that has learned to paint and is now raising money for charity through his artistic skills, I decided to investigate further. After talking with owner Ron Krajewski and watching some of the videos of Metro Meteor in action, I realized this is one of the best stories I've come across in a long time! Metro Meteor, a bay gelding by City Zip, was a hard-knocking racehorse. In spite of the knee issues that plagued him throughout his career--he had two operations to remove bone chips--Metro Meteor still managed to retire with a solid slate of 8-3-3 from 27 starts, for earnings of nearly $300,000. Included in those efforts was a second in the 2005 With Anticipation Stakes at 2 and a third in the Pebo's Guy Stakes at Belmont Park during his 5-year-old season. During his five seasons of racing, Metro Meteor was campaigned by five different ownership groups, the last of which was Renpher Stable, which purchased the gelding in a private transaction. At this point, Metro Meteor had gone from being a stakes and allowance horse to a low-level claimer at Penn National. In 2009, after racing just twice for Renpher Stable, a partnership group headed by Bob Oliva, it was decided the gelding's knees were in too poor of a condition to continue running. Oliva put the word out among his partners that Metro Meteor needed a home, and Krajewski and his wife, Wendy, decided to step up to the plate. "We got a couple years of light trail riding out of him, but we've been battling with his knees the whole time we've had him," said Krajewski, who lives in Gettysburg, Pa. and boards Metro Meteor in Rocky Ridge, Md. "We've done knee injections, supplements, wedge shoes... everything we did made him a little bit better, but he was never great." After an x-ray evaluation and due to the fact Metro Meteor had very little flexibility in his knees, his veterinarian suggested the gelding's trail riding days should come to an end. When the news about Metro Meteor's situation came, Krajewski, a full-time artist, let his creative juices flow as he pondered the gelding's next adventure. "Metro is just a showboat--he hangs his head out of his stall and bobs it up and down, and he's really mouthy--always wants to hold something in his mouth," said Krajewski. "I was wondering if I could get him to hold a paint brush. I was looking for ways to spend time with him, because I just love him, and so I decided to teach him how to paint." It didn't take long before Metro Meteor got the hang of painting. 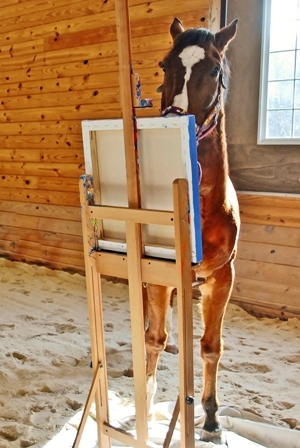 Krajewski chooses the colors for him, loads the paint brush with paint, and then the gelding holds the brush in his teeth and applies the strokes to the canvas. The results of Metro Meteor's painting sessions were so impressive that Krajewski decided to spread the word about his story. Since Metro began painting in early December, his story has been broadcasted on four northeast-area newscasts and featured in several other online stories and blogs.The gelding also has more than 1,000 "likes" on his Facebook page, which you can visit by clicking here. 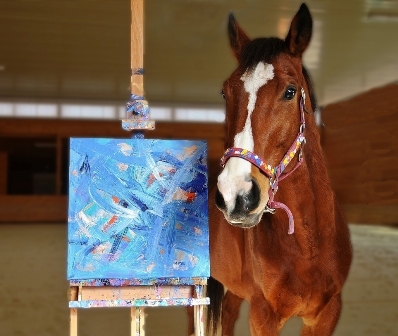 "He's a totally different horse when the cameras and recorders are here," said Krajewski of Metro, who has his own studio at his stable and spends several hours a week painting with his owner. "He puts on a show and dances around--it's like Zenyatta in the paddock." 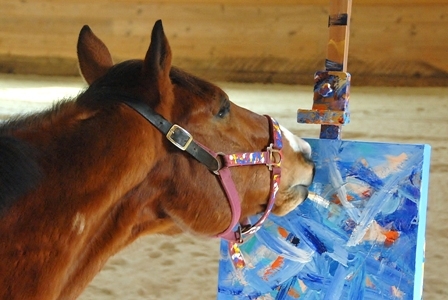 Information on how to purchase Metro's paintings, along with some videos of the gelding in action, is available at www.paintedbymetro.com. Check it out--there are even some "Metro Mini's" available for just $40 each! Half of the gross sales from Metro's work go to New Vocations Racehorse Adoption Program, an organization headed by Anna Ford that I have featured on this blog several times before. Krajewski uses the other half of the proceeds to help pay for Metro's costly knee treatments. Metro's work is also available at Gallery 30 in Gettysburg, and in December, the gelding was the gallery's best-selling artist. Since December, Krajewski has donated $3,000 to New Vocations from Metro's painting sales, which says something about the quality of his work! Which painting of Metro's is your favorite? Or would you choose your own colors and have Metro paint a custom piece for you?